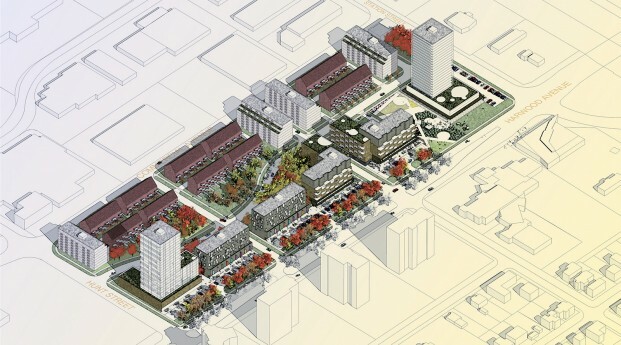 Ajax Plaza Redevelopment – Bousfields Inc.
Bousfields was retained to carry out a Highest/Best Use Analysis for a 5.1 hectare (12.7 acre) site at the southwest corner of Harwood Avenue South and Station Street in the Town of Ajax. The analysis addressed the relevant planning and urban design policies, identified the highest and best use design strategy, and consequently provided four development options of appropriate form and magnitude for the site. Bousfields undertook a detailed review of the merits of several development options and a preferred option was identified and recommended. The preferred development option included 10-storey mid-rise and 4-storey live-work buildings along the perimeter of the site, high-rise buildings to accentuate the corners, a central green open space, and a bus terminal at the north edge of the site. The preferred development option had a total residential and commercial GFA of 156,800 square metres, resulting in a density of 2.2 times the lot coverage.